2201, 2nd floor, Sec 132 Express Trade Tower 2 Noida 201301, U.P. 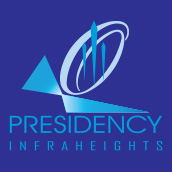 Presidency Infraheights Pvt Ltd has revolutionized the real estate business in India. They strive to achieve better everyday in the real estate sector by adhering to strong business principles with focus on quality construction and technical competence. Their vision is to facilitate the fulfillment of life by providing projects of superior quality, keeping in mind the needs of their consumers to guarantee complete customer satisfaction. Their mission is to develop signature real estate projects all throughout the country created using the most innovative designs, technology and services. Presidency Infraheights has developed commendable residential projects in Greater Noida. In the near future they will also diversify into many more projects including integrated townships incorporating innovative designs, ultra modern amenities along with strategic locations. They keep in mind the needs and requirements of the consumers before conceptualizing and building any project. Mr. Owais Usmani has been the guiding force for the success of Presidency Infraheights along with a team of directors and managers having years of experience in the real estate business. They are not just a commercial entity they have also contributed for the betterment of the society by developing eco friendly projects all across the country.